Having a strong sales process is one of the most crucial components to having a successful photography business. If the sales process is intimidating to you, here's something that can help you out! Mark your calendar for June 7 at 2pm ET. 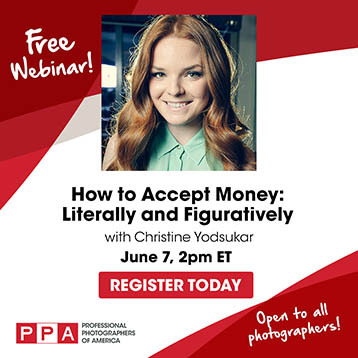 PPA will host a FREE webinar, "How to Accept Money: Literally and Figuratively" with Christine Yadsukar, that covers what you need to know to be successful in sales. Christine will share her sales process with you, explaining what she says and does with her portrait clients from the initial phone call to booking, then through the design consultation, and ultimately how that results in the sale of custom artwork. She will also share with you how she unlocked her ability to accept large amounts of money without feeling guilty or slimy, and how you can do it too! If you're ready to improve your photography sales, register today! This live webinar is free and open to all photographers to attend. If you can't make it to the live webinar and are a member of PPA, you'll have access to the recording in PPA's Online Learning Center, along with hundreds of other on-demand videos on various photography topics. You've got to be a member to access this library, so join PPA today!